Okay guys, brace yourselves! I tried. I really did. But as I was going through all of the pictures I took for my fall home tour, I just could not edit them down to any less than what is included! #bloggerproblems But I don’t think you’ll mind! 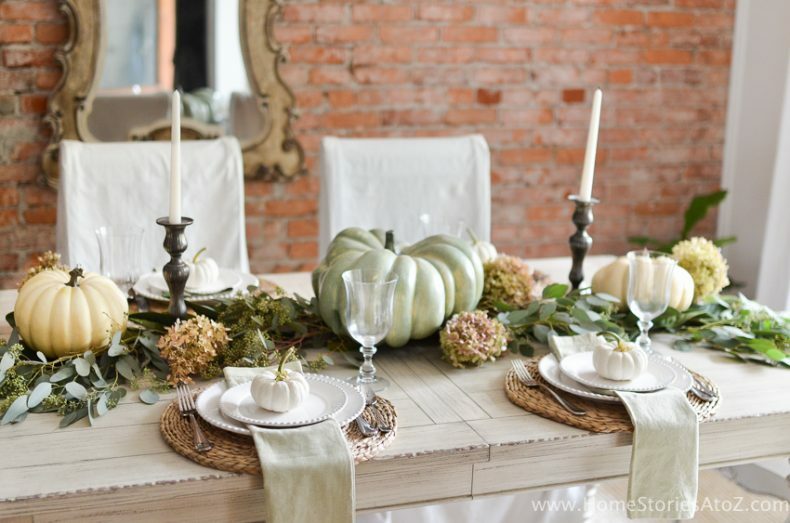 Today I am honored to be joining 11 other bloggers for Laura’s Finding Fall Home Tour. All of the gorgeous fall homes are linked at the end of this post, so please stop by and visit each one. This post contains affiliate links. 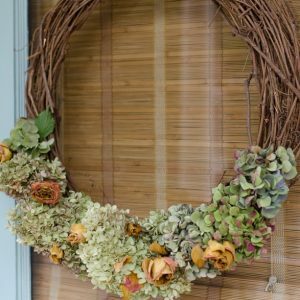 This year, sage greens, magnolia leaves, seeded eucalyptus, and dried hydrangeas spoke to me. 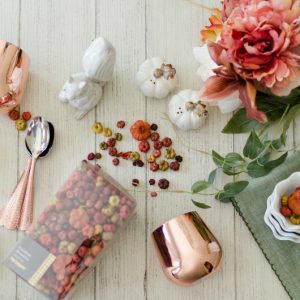 I used a soothing color palette to ease my family from summer blues (and back-to-school blues) into early autumn hues. 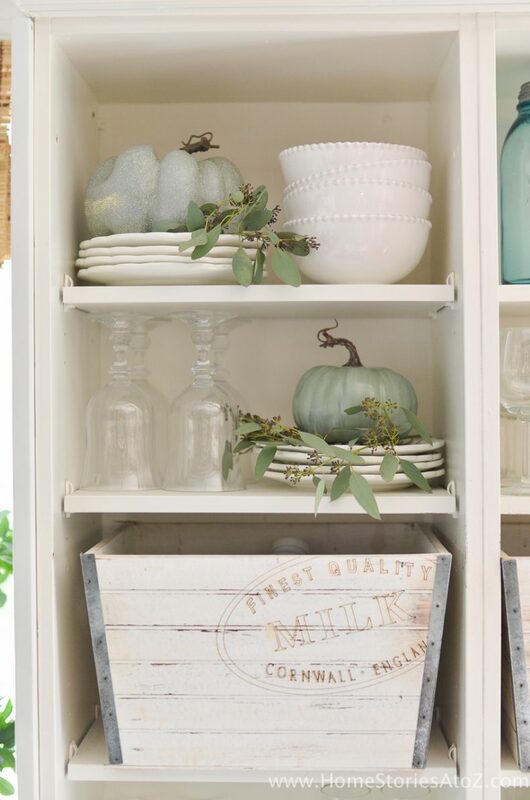 I hope my neutral fall home tour gives you some DIY home decor fall ideas for your own home. Feel free to pin and share your favorite ideas! Our family of four lives in the city in a renovated Victorian row home that we purchased as a flip nine years ago. The house is narrow and tall with a very open concept (think bowling alley) floor plan. It can be a challenge to decorate an entire level with no walls between rooms! If you find yourself with a similar challenge, my advice is to choose a tight color palette and use it throughout the entire level. Using cohesive colors will ground and unify the space. 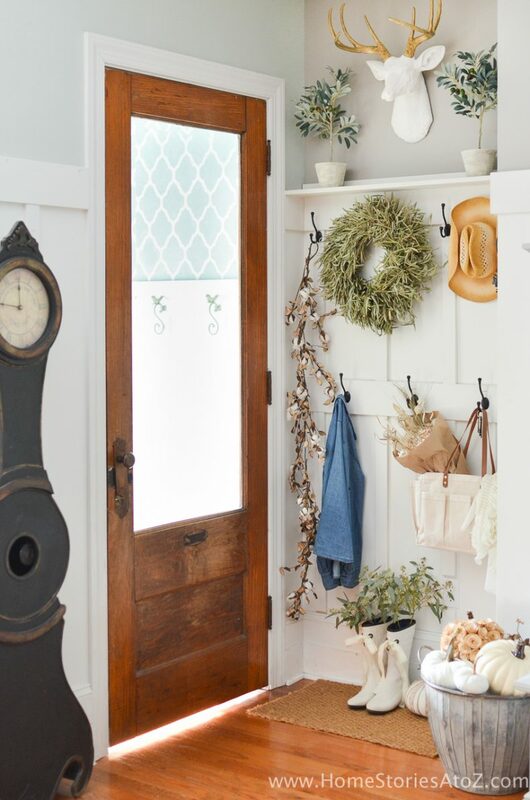 Our home has a vestibule entryway containing a small mudroom within; however, during the winter months it is FREEZING inside the vestibule and no one wants to stand in there any longer than necessary. Backpacks, coats, mittens, hats, and boots were migrating out of the mudroom and onto the floor inside the door where it is warm. It was driving me batty! I solved the problem by creating a second coat and shoe area. 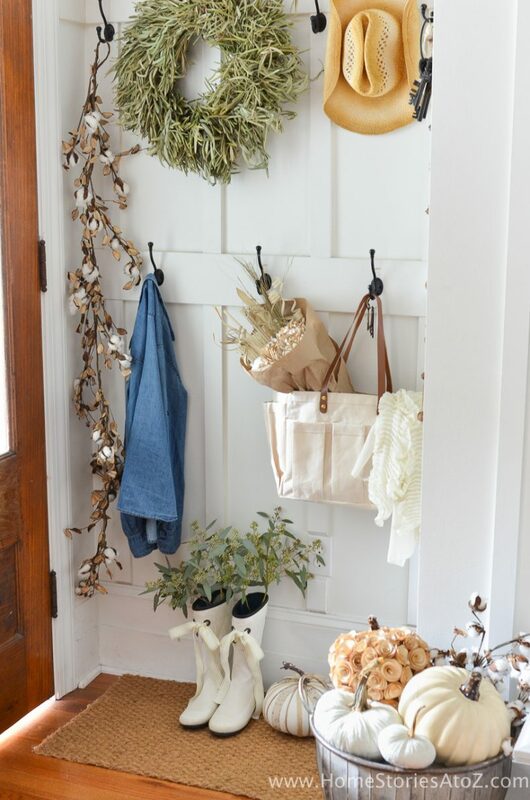 Who knew that some board and batten and hooks could look so cute? 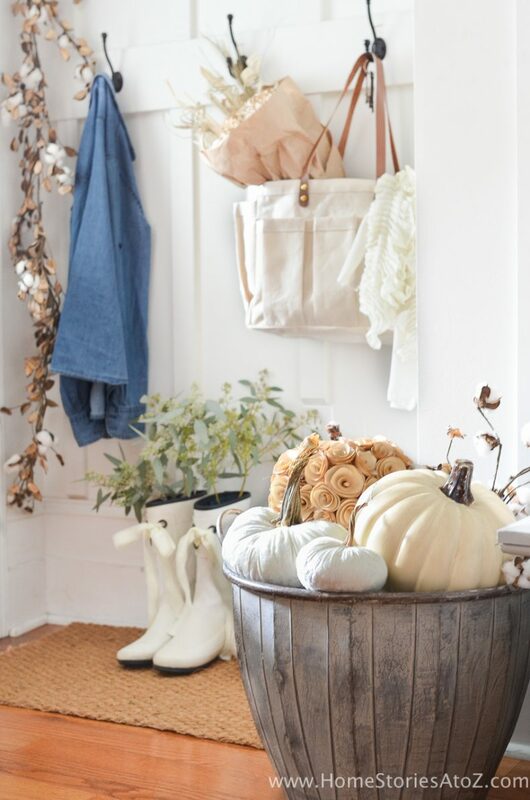 This tiny nook of an entryway has become one of my favorite spots to decorate each season. 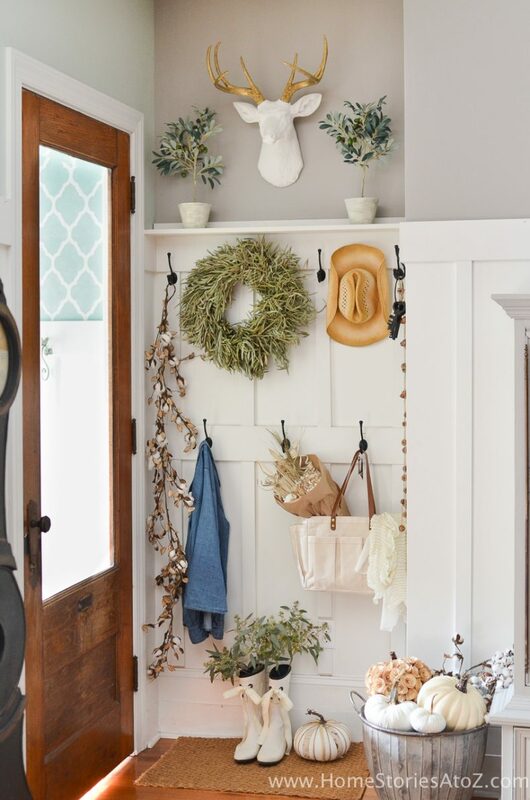 Granted, my entryway rarely looks this cute, but every few months my family accommodates my wishes and keeps their bags and shoes hidden elsewhere! Pictured below is Eowyn–one of my two Pomeranians. Don’t let her cute smile fool you! She is a sweet little rascal who absolutely hates it when I decorate. She will bark and cry at me each time I do. Things may or may not occasionally shatter, clatter, and fall off the wall as I’m moving things around. Poor thing now has decorating PTSD. #bloggerdogproblems  But don’t feel too sorry for her. She is loved, adored, and very much spoiled. When our home was being flipped, we were thrilled to find–hiding underneath all of the layers of wallpaper and plaster–these gorgeous brick walls! 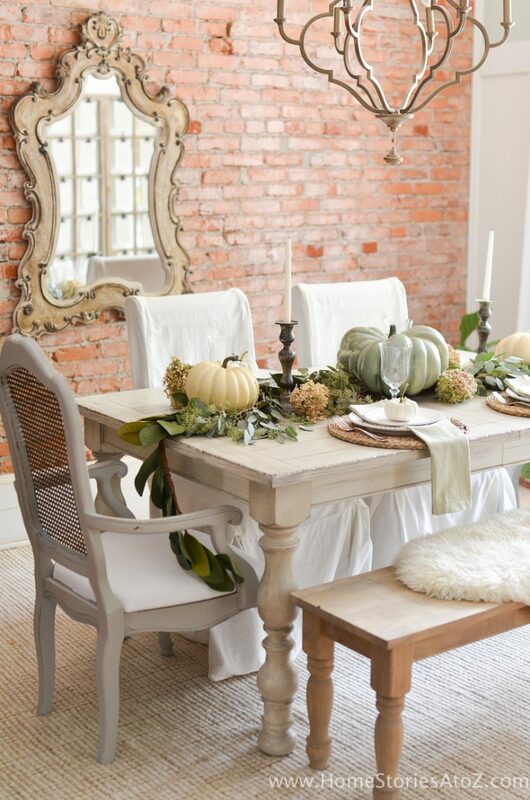 Our exposed brick steals the show in our dining room, hallways, and all of the bedrooms. Besides my front door, my brick walls are my most favorite element in the house! 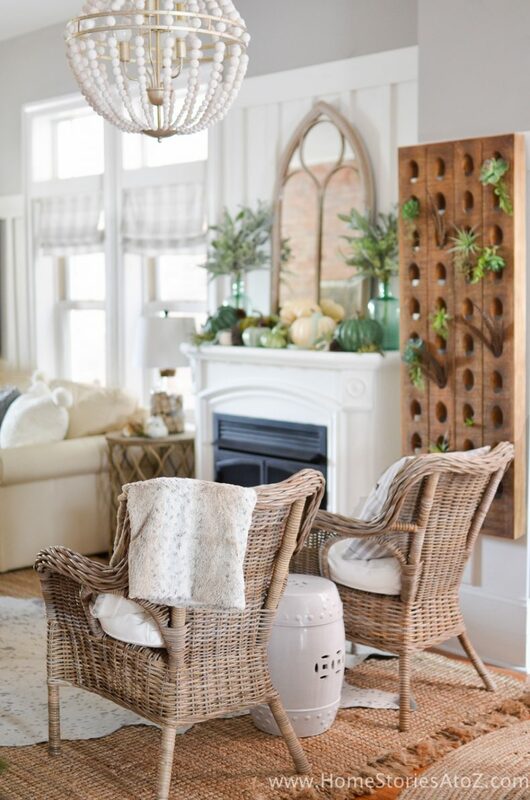 They just add so much warmth, charm, and character to each room. But enough about the walls, let’s talk about my new table! Our old dining table was horribly scratched and needed refinishing, and I just didn’t love it that much to begin with. I was craving a chunky farmhouse table that looked timeworn and didn’t need to be babied. This new dining table is absolutely perfect for our family and looks great in this space. I just dragged it into the house, unpackaged it, and put all 200 lbs of it together by myself a few days ago, so you all are the first to see it! I figured a brand new farmhouse table deserved some proper farmhouse decor! 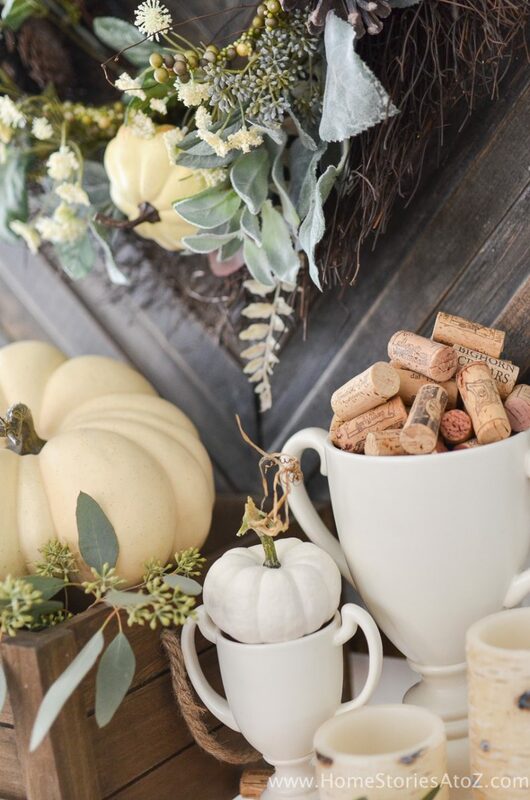 Dried hydrangeas, faux and real pumpkins, faux magnolia and real seeded eucalyptus branches all work together to create a casually elegant tablescape. 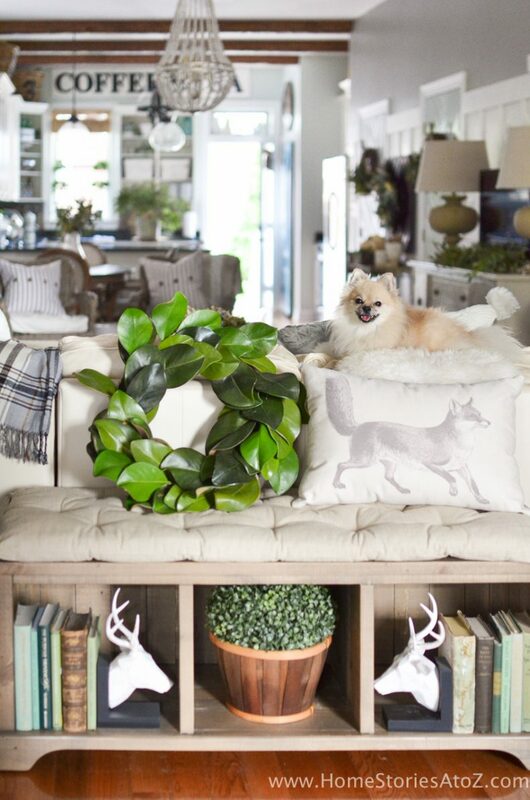 For seasonal decorating, I almost always mix real and faux greenery together. When you add something fresh to the faux, you have greater difficulty telling which is which! Toss-pillow covers and throw blankets are my number one decor addiction and my first line of defense in my decorating arsenal! My husband thinks I need an intervention, but I adore textiles and have no desire to change. Can’t stop won’t stop!  They are such an easy and inexpensive way to completely change the look and feel of a room. 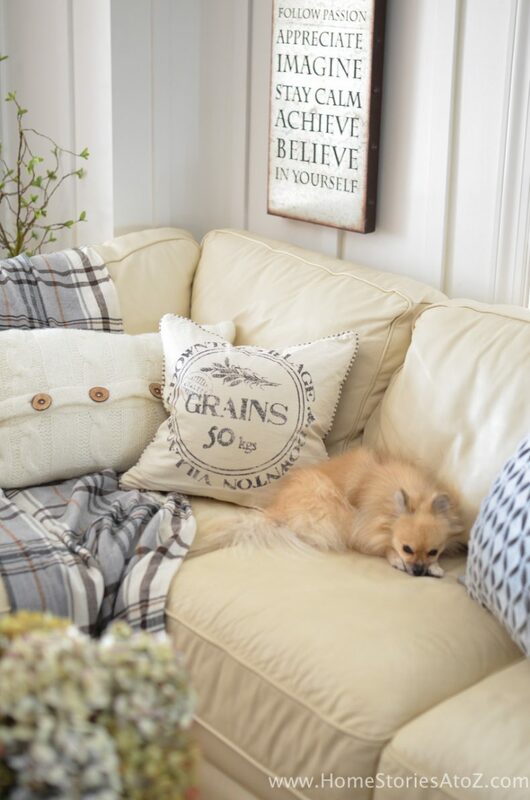 Remember that if you’re really short on cash, two cloth napkins, an old sweater, or a few placemats can be refashioned into cute new pillow covers with minimal sewing and skill. My second line of defense in my seasonal decorating arsenal is the vignette. 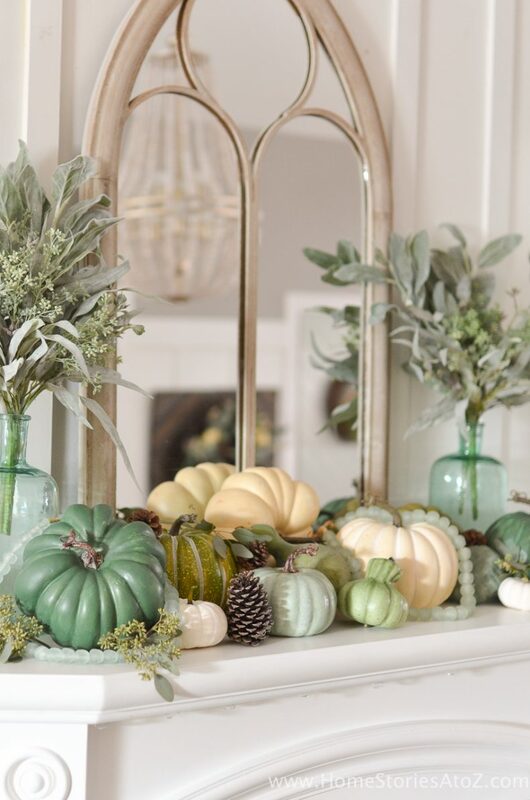 If you know how to create a vignette, then you know how to decorate! 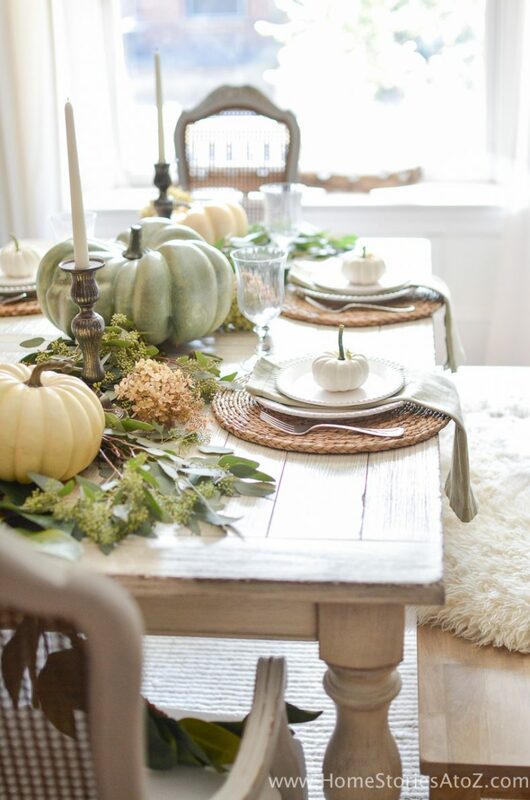 Click the link to learn my best tips on how to create a seasonal vignette. 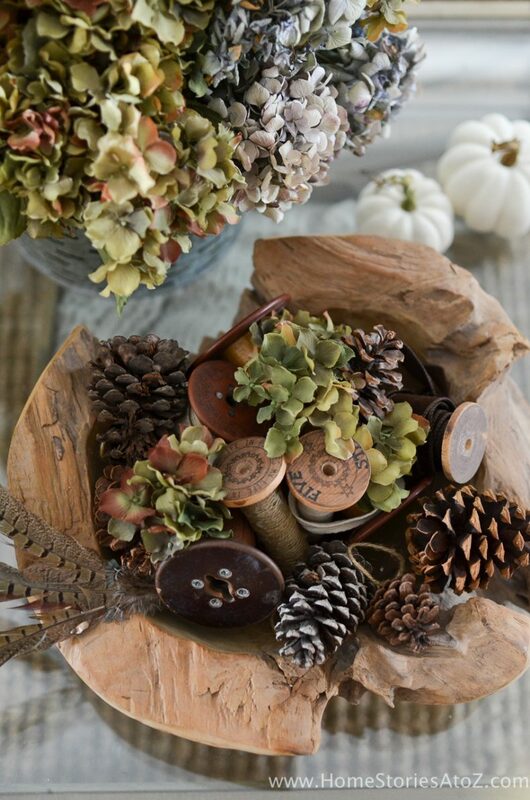 On the coffee table, I placed an olive bucket filled with dried hydrangea stems and a wood bowl filled with vintage wooden spools and pinecones. 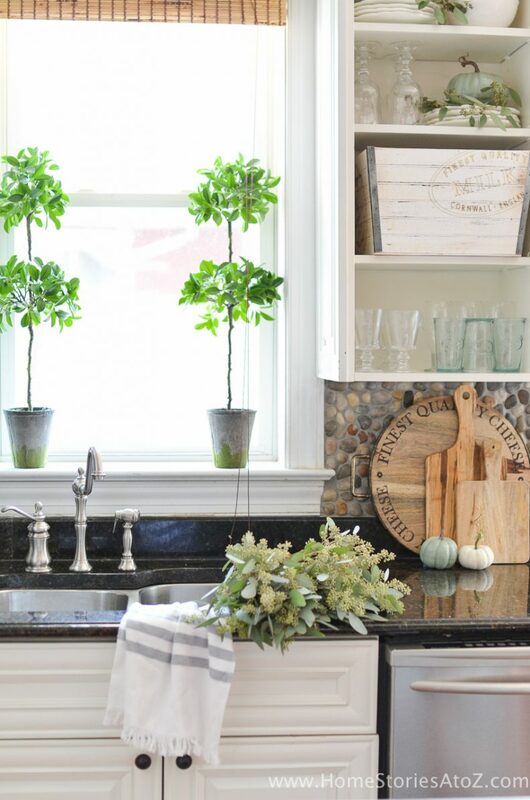 Bringing natural elements into each room is another easy DIY home decor idea that never fails. 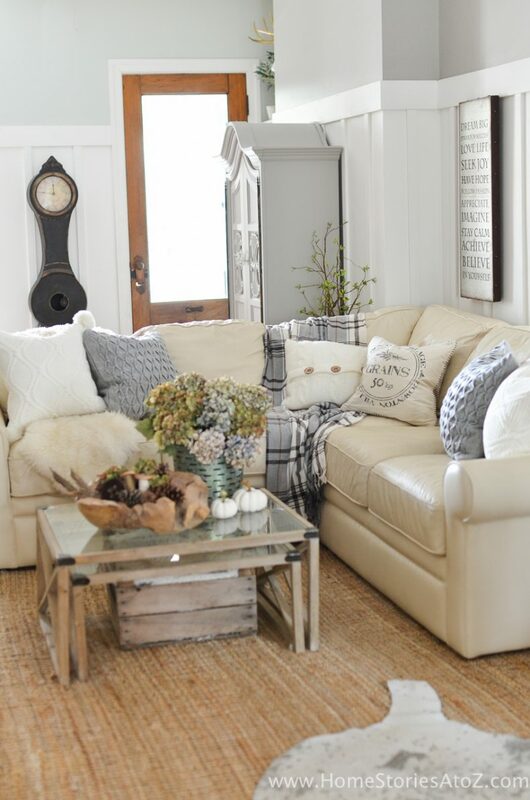 Don’t be afraid to mix in some quirk to your decor! I always like to add a few fun elements that just make me smile. Last year it was my chubby chipmunk pillow, and this year it’s my television sporting antlers instead of bunny ears. It’s a bit ridiculous yet quirky, funny, and cute. Decorating should always be about creating a space that brings YOU and your loved ones joy. 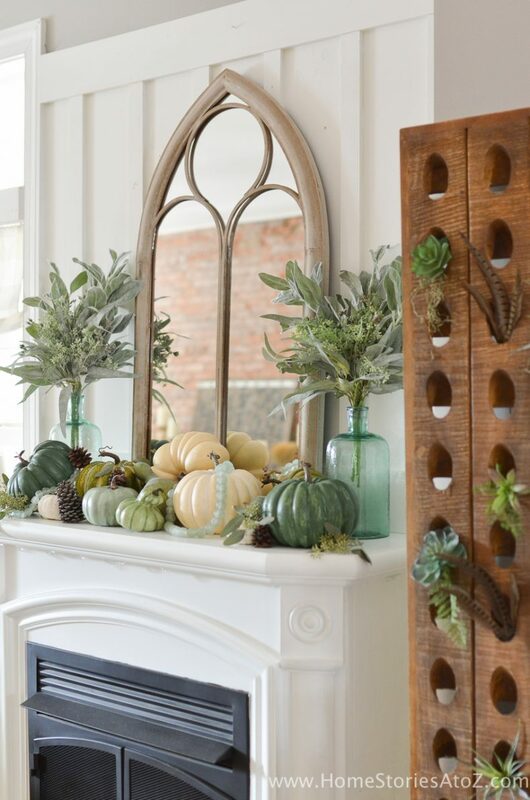 Nothing beats good ole’ symmetry when decorating a mantel! 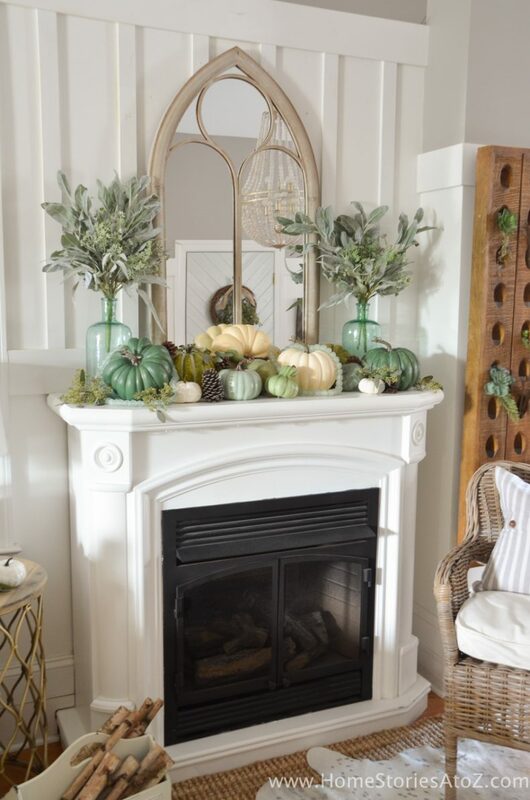 I’ve taught decorating classes to groups of women on how to style a mantel, and the best tip I can give is to fall back on symmetry when you’re in doubt. A grounding object, such as a mirror or piece of art, with candles, vases, or bottles placed on either side is pleasing to the eye and always works. I usually don’t have too much trouble finding at least a few fresh pumpkins this time of year, but this year was different! Almost all of the pumpkins you see were inexpensive Walmart pumpkins that I painted. I’ll do a tutorial for you later this week on how I transformed them from fakey orange colors to beautiful shades of green. Besides being a functional piece that stores our wine and liquor, my bar cart is a surprisingly fun item to style! It used to stand next to the dining room and I decided to move it between my DIY herringbone doors. I’m loving it over here closer to the kitchen. 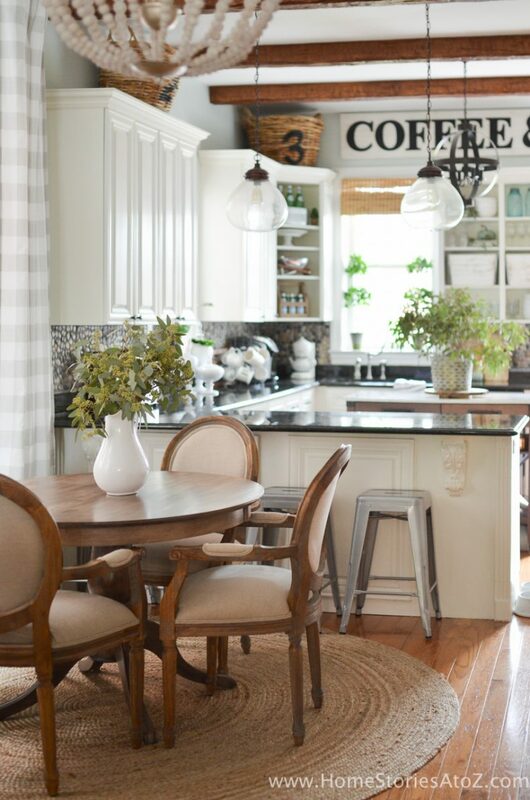 Our breakfast nook and kitchen are our last stop on the tour. 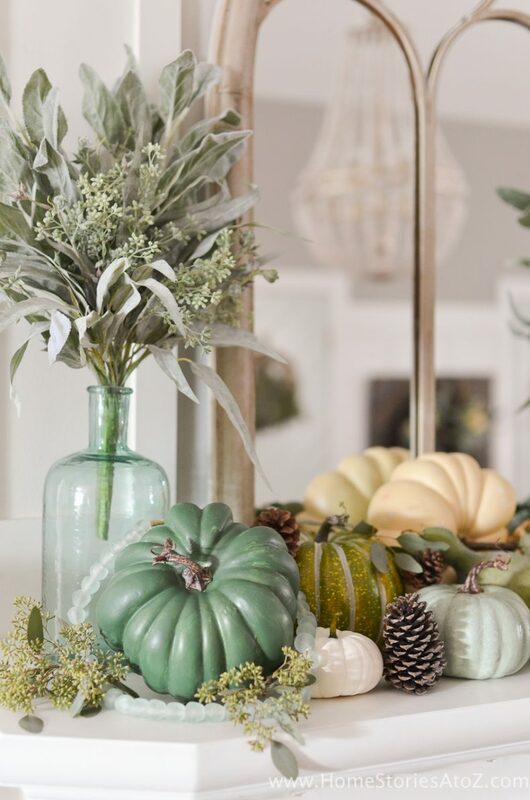 I kept things very simple and unfussy in here for early autumn by adding just a few touches of green and a few painted pumpkins! Our kitchen is a budget-friendly DIY project that you can read all about here. While it isn’t exactly my “dream kitchen”, I’m proud of how little we spent to make it feel like home. This next picture makes me giggle. If you look closely you can see that there is a tiny bottle of essential oils labeled “Attention Assist” that I bought for my ADHD husband. He loves to leave it out of his basket where we keep all of our vitamins, supplements, and oils perhaps just to drive me crazy–or maybe so he remembers to use it. 😉 I meant to toss the bottle in his basket before I began photographing the kitchen but forgot. Perhaps I should have rubbed some Attention Assist on myself! I hope you enjoyed my fall home tour and DIY home decor tips! Enjoy the rest of the hop below! I love everything about this! 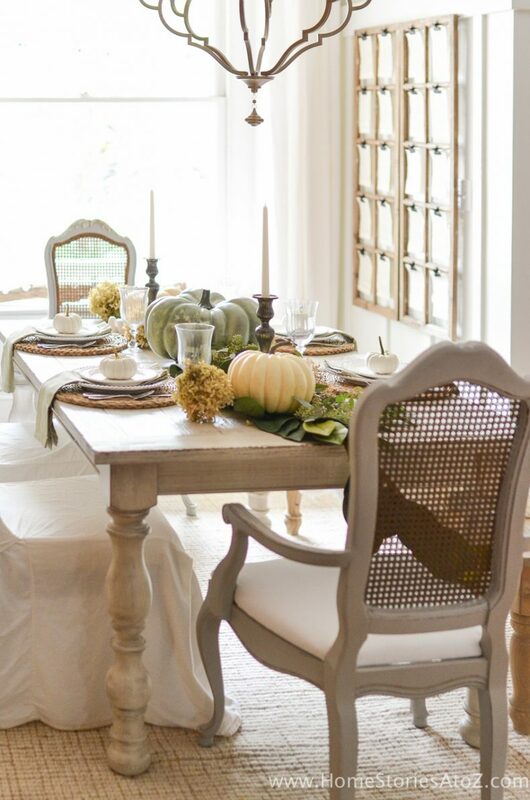 Such a great twist on farmhouse fall. 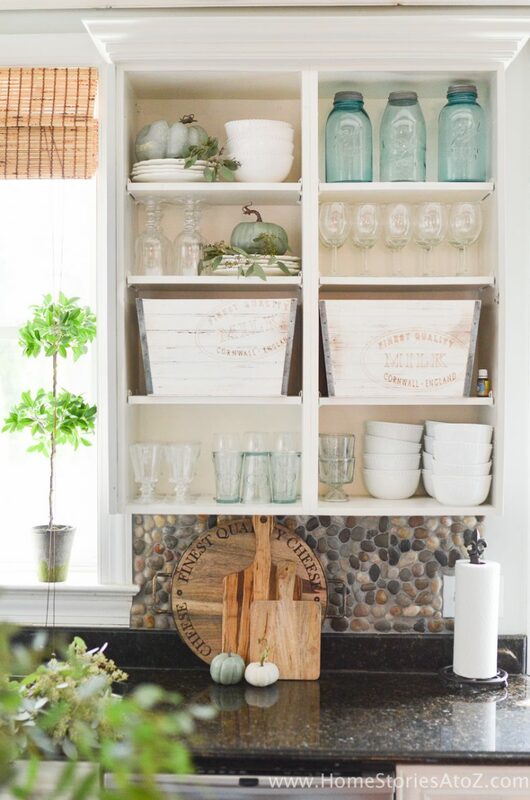 Would you mind sharing where you got the “milk crates” in your kitchen? Very tastefully done. I love your place settings. Would you mind sharing where you purchased your stemmed goblets? 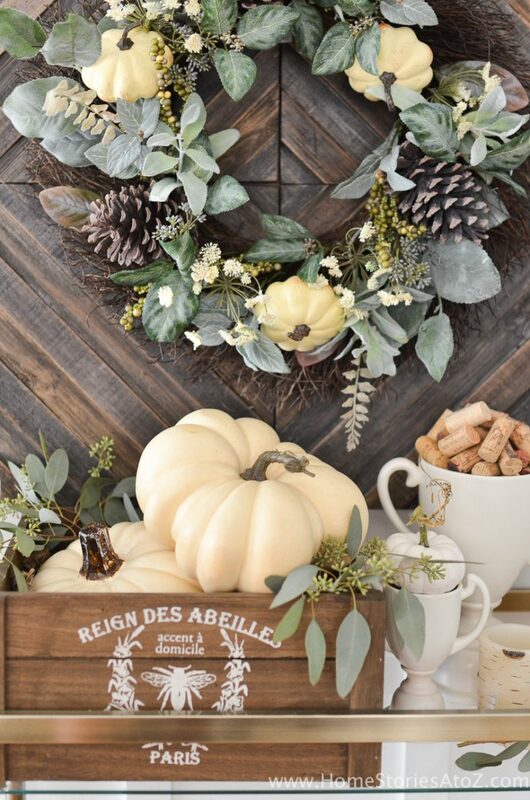 Love your Fall decorating ideas. Your home isn’t gorgeous! Can you please tell me where you bought your coffee table? I love your taste!!! So elegant , yet laid-back. the colors are so soothing and inviting:) My house is a wish mosh, although I am older and times have changed! I was checking out the foyer and then went to shop this room, I am not sure how that works. If you could let me know that would be great! Beth I love your white plates and bowls where did you get them? 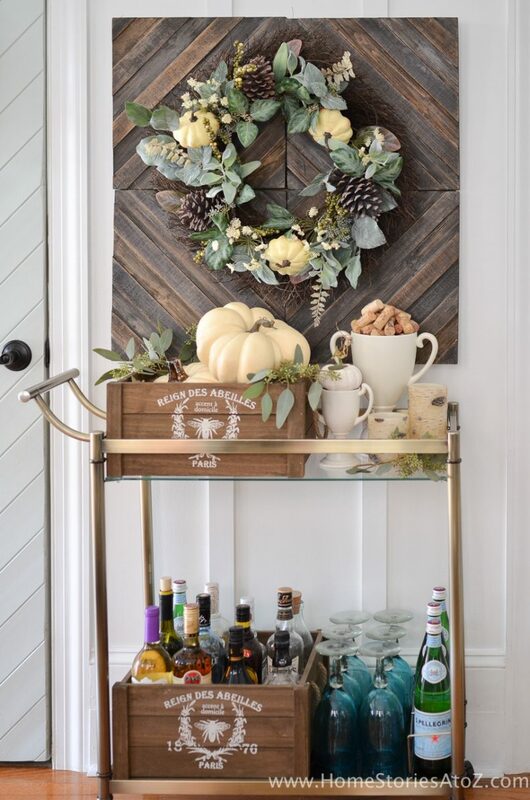 Can you tell me where you purchased the wood piece behind the wreath over your cart? Thank you! I know you said you painted most of your pumpkins…Does that include the one in the center of ypur dining room table? The blue green one? 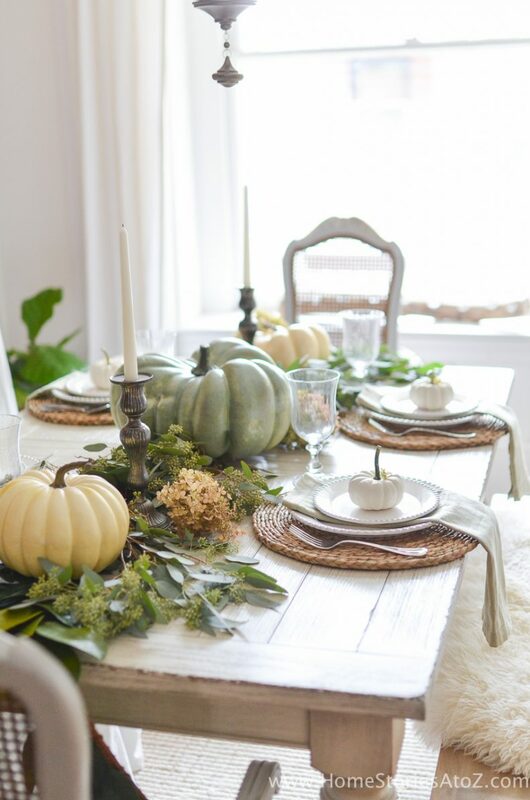 The pumpkin in the center of my dining table was purchased from Michaels, along with a few of the odd-shaped gourds on my mantel. 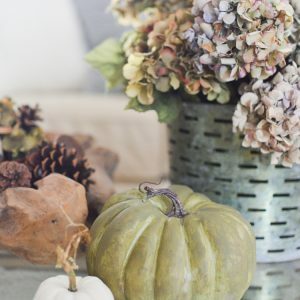 Love your fall decor Beth! Your home is beautiful. I have been looking for sea glass bead garlands and wonder if you would share where you found yours. Thank you for your help! It is like you took all the pieces that were rolling around in my brain, but just did not know how to put it together or where to find them. Thanks. That is a real help. Have to order quick. Cannot wait to see how you embellish for other holidays and seasons. Hint hint. 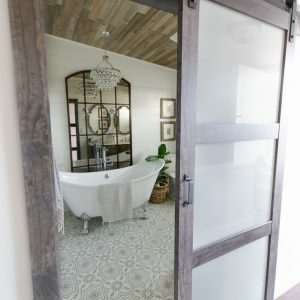 Can you tell me where you purchased the 2 round mirrors in the bathroom? Thank you! They were found at Lowes. Absolutely gorgeous…love every detail adore every inch of your beautiful home! So inspiring. No offense to anyone but yours is my favorite for this tour. Enjoy your fall!! Please add me to mailing list. Love your dining table! It looks perfect for what I have been looking for in our breakfast area. Can I ask did you purchase it through hayneedle? RIght now it looks like it is sold out there but through Houzz it seems available. I have not purchased through either of those websites so am a little hesitant. Any opinions on that? Thanks! Hi Laurie! Yes, I purchased from Hayneedle here: http://rstyle.me/n/bzcu5in7aw. I think the table will be back in stock October 4th. I had a discount code through Hayneedle and their door service and free shipping sold me. I’ve also ordered items from Hayneedle before with no issues. I wouldn’t personally order through Houzz because they don’t have free shipping and that can be another $300 or so! If you do choose to order through Hayneedle, I’d love it if you’d use my affiliate link. You won’t get charged any more than the asking price but I get a small commission in return for the referral. Also, it looks like Riverside items are 20% off today only with coupon code: JR5977 which would bring it down to $593.60! I would call Hayneedle, tell them you want to buy the table, and use the coupon code that expires today. They may allow you to order it at discount on backorder. Your home is lovely. I especially like how you decorated your mantle – perfection!! Enjoy the end of the summer! Your entire home is just “gor-ghaa”! I love, love, love the exposed brick, but I’ve always wondered if they are cold? Of course, if you have a town house, perhaps none of the brick walls are outer walls. Anyway,very beautiful!!! Great question! They are not cold at all but we share this side of the house with our neighboring “twin” which makes a difference. If it was an exposed exterior wall it would be a different story–and probably not the best idea! Thank you so much for opening your home. Where did you get the kitchen island? It is the perfect size for your kitchen! Thanks Kathie! 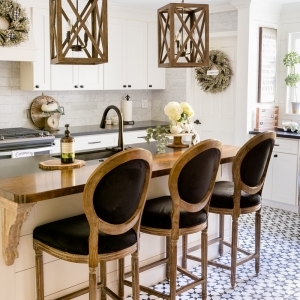 The kitchen island is from Sauder Furniture. Thanks Beth. We would like a small island and this looks good. Will check it out. Beth everything is just stunning! I absolutely love the color palette and all of the details are gorgeous. And your dining room??? So swoon worthy! Love being apart of the tour with you. It must be a Pom thing because my Pom Spanky (who looks a lot like your Pom) will bark at me when I’m trying to paint or clean! The only time he is quiet is if I’m sitting down. It’s like he’s yelling at me that I’m doing too much! Well it’s what I tell myself anyways! Love the painted pumpkin idea! I was thinking to myself “How in the world did she get pumpkins already ? She’s not too far from me! ” ….I live in Maryland. And I never saw them in that green color before! Glad you told us they were painted! I remember last year buying white pumpkins from Wally World and they actually mildewed! So now I’m going to go buy some paint and paint those suckers! Ha! Poms are seriously the best. They just have so much personality. 🙂 Thanks for stopping by and visiting me! I really enjoyed the home tour, Beth! I am a huge fan of your brick wall! And I think your kitchen is lovely just the way it is. I have the same crates from Target that you use for your essential oils/vitamins/supplements. The chandelier above your dining table caught my eye. I am looking for one for our new home. This is the model – http://www.brownstonesatcentralpark.com/index.cfm/id:1537. Do you think it is too French country to fit in the master bath? The feel of the model is so cold and I really would like to warm it up with some more natural textures, even though we will have the same marble throughout our bath. I would love your opinion if you have time to take a look. I’m also looking forward to the pumpkin painting tutorial! What a gorgeous Brownstone! We have some that are so incredibly similar to these models a block up the street from me, and I just love them. I really like the chandelier that they’ve used in the model’s master bath. I think that works better with the marble. Congrats on your new home! 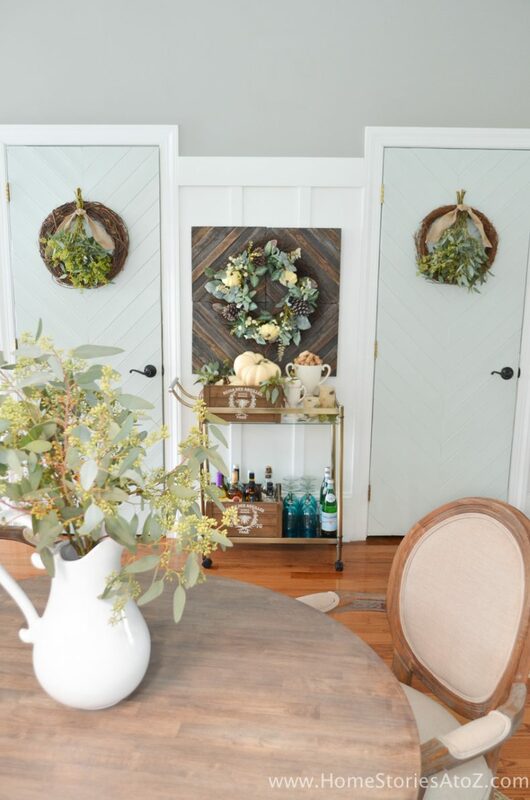 I love every room and how you tied it all together – I wouldn’t have thought sage for the fall, but I’m loving it! I want your entryway in my house – but with our house, we don’t have a good spot for one. 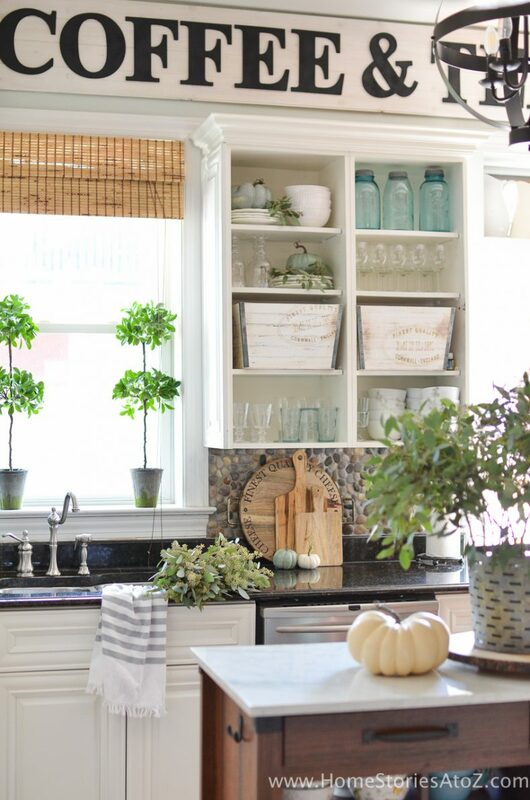 Such great decor – love seeing what you put together. I much enjoyed taking the tour ! So airy and open – Like living on a cloud !! Love the new table. Heavenly rustic!! I LOOOVE your brick walls. Your dining room is my favorite. 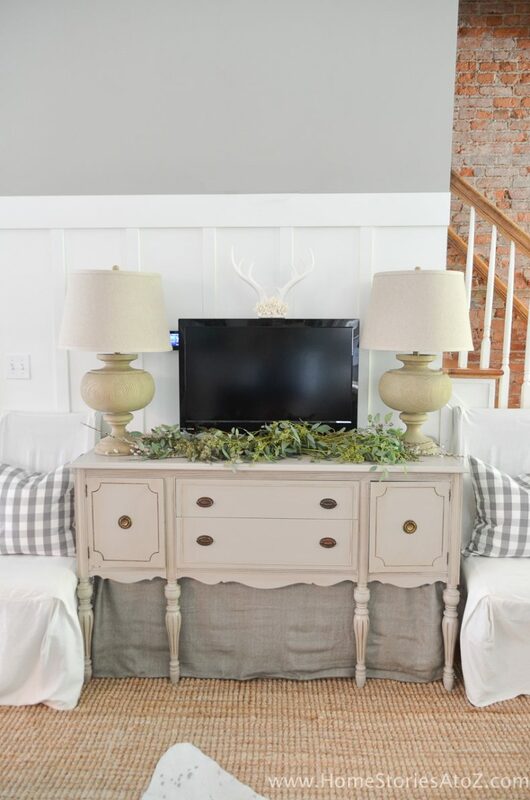 And I love how you were able to use a pretty table for your TV and solved the problem of seeing all the cords by hanging fabric. Happy Fall! Oh my, it’s all so beautiful! Totally in love with your home tour Beth!! Absolutely gorgeous!! What a beautiful home, Melissa!! 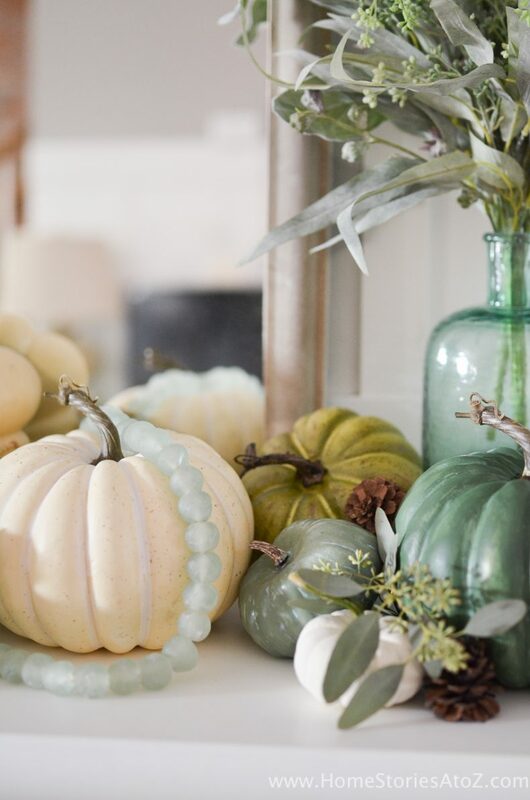 Are all your pumpkins real or faux, and can you share where you bought them, please! Thanks for sharing! Beth, your use of pumpkins in decorating is so creative and beautiful. I can’t wait for your tutorial on painting pumpkins. Yours are gorgeous! Beth your home is gorgeous! I love those antlers and how you said we should enjoy our decor… What a beautiful table setting amongst all the other lovely details! You have the most beautiful home ! WOW ! Thank you for sharing and giving me so much inspiration once again ! 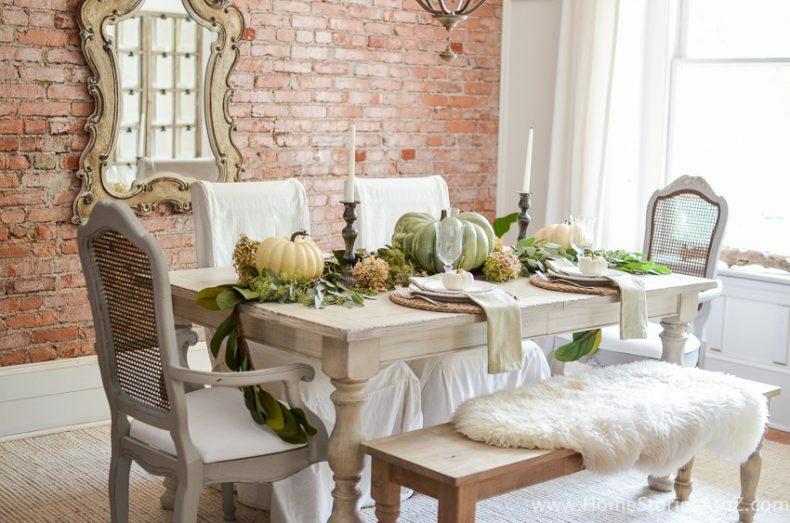 This is such a beautiful fall tour – lots of wonderful decorating ideas! – loving all of the creams and greens. 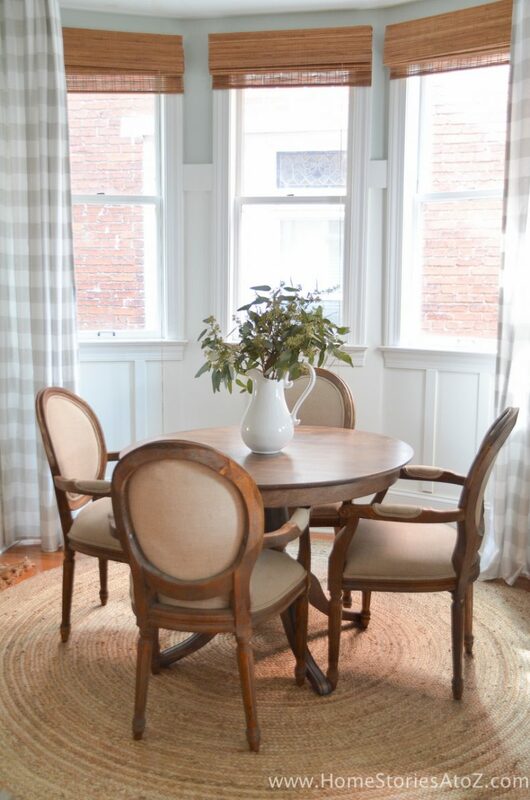 I am swooning over your new table – could you share where it was purchased? Sure! I purchased it on Hayneedle: http://rstyle.me/n/by4x2zn7aw It looks like it’s currently out of stock, but it’s worth the wait. It’s very sturdy, comes with a leaf, and has a gorgeous aged look to it. Every single detail is perfect! Love your sweet pup! So happy to be touring with you! Thanks KariAnne! Happy fall to you girl! 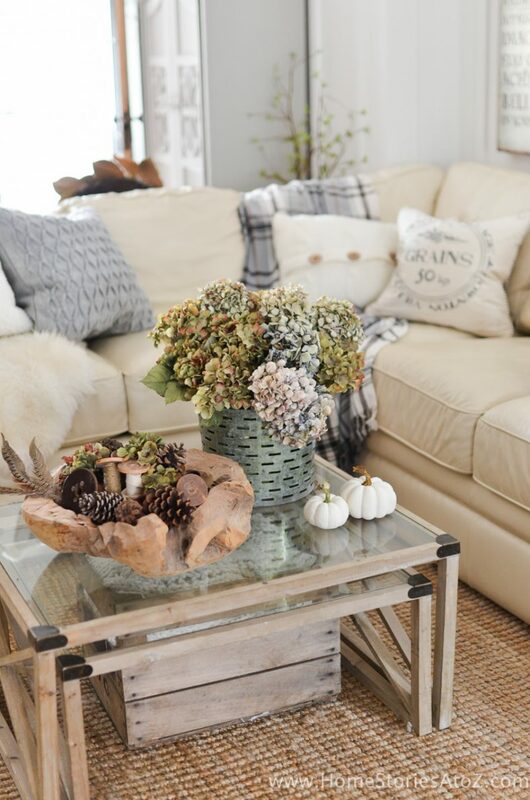 I LOVE your Fall home tour and all of the fall decor you’ve added to your home! 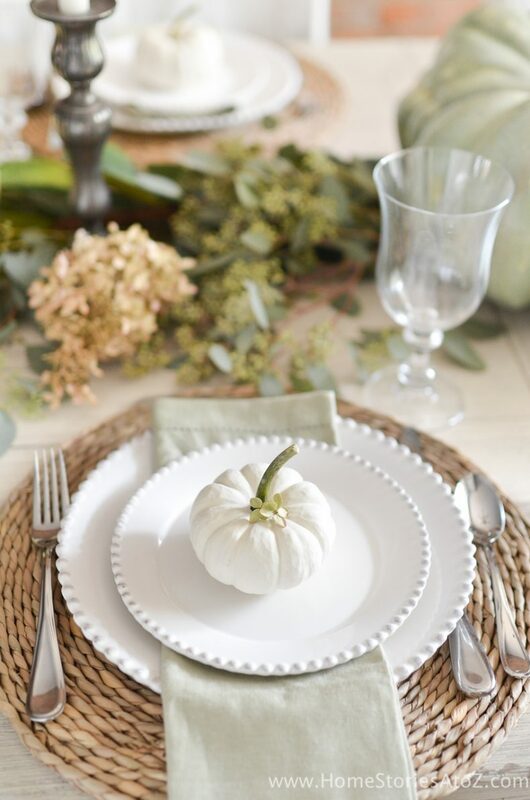 My favorite was the beautiful fall tablescape…..so simple, yet so elegant! 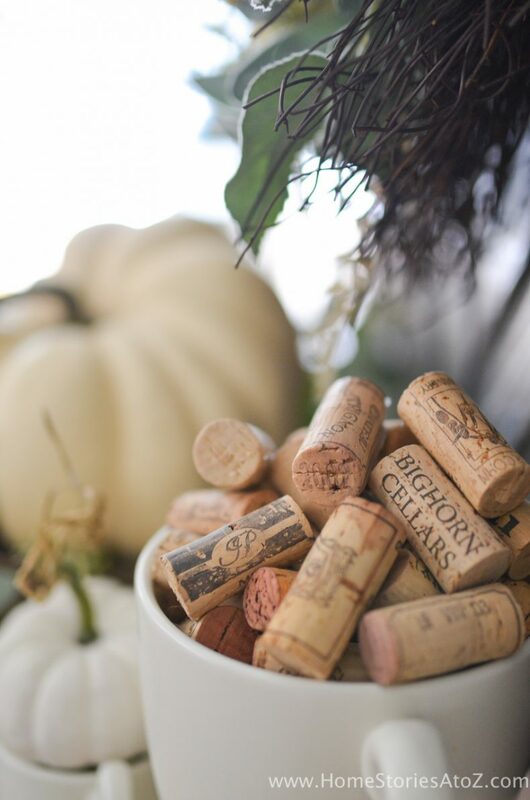 Thanks for sharing…..happy fall! Thanks! My tablescape is my favorite element as well. 🙂 Thanks for stopping by for a visit! Absolutely beautiful Beth! Everyt part is perfect! I love the soft color scheme. It’s a nice way to ease out of summer into fall. 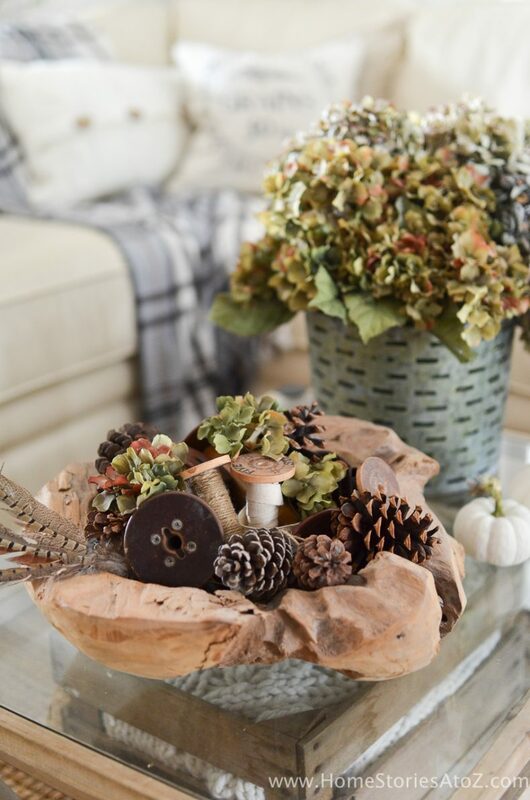 Beth – all of your fall touches are so elegant and pretty. Thank so much for being part of the tour! Thanks again for including me! Absolutely Gorgeous Beth! 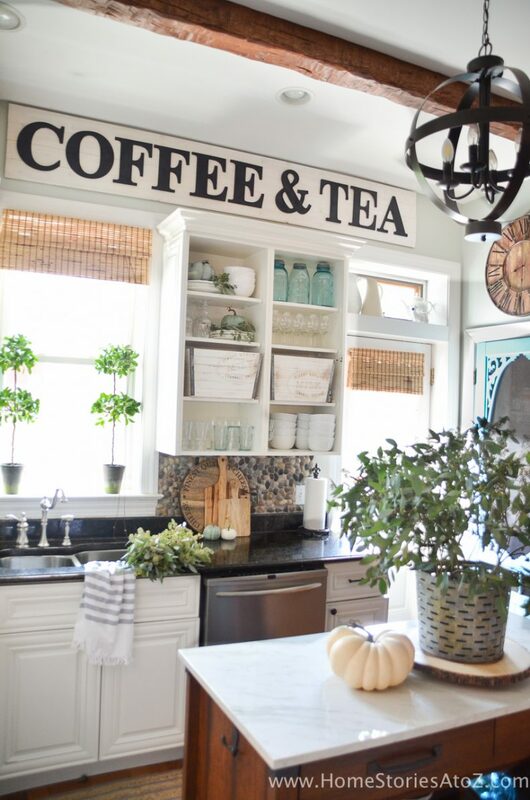 You are so talented and I just love all the neutrals in your home. Also, where did you get that garland for your dining table? love it! Thanks Deb! The garland was in the Clearance section at Joann’s. Gorgeous Beth!!! Looks so inviting and welcoming 🙂 Is your house still this clean? lol. Mine is NOT! -ha. Ha! 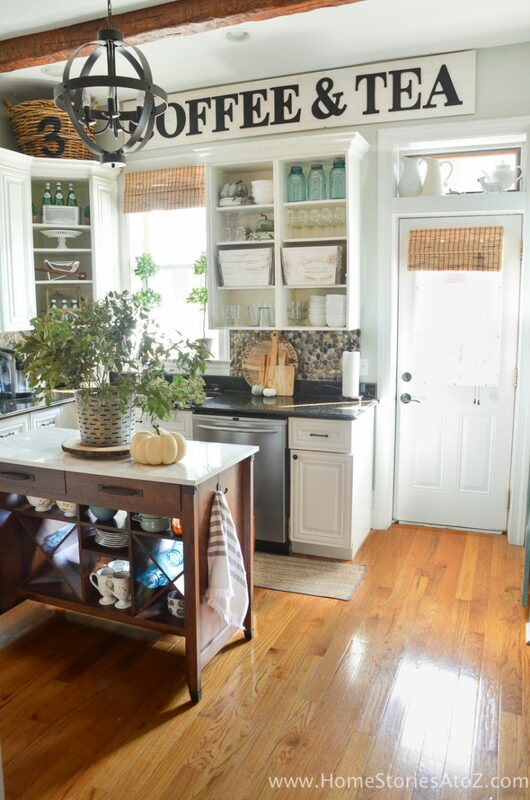 The kitchen isn’t looking this good, but the rest of this level is surprisingly still tidy. Now the rest of the house is a different story!